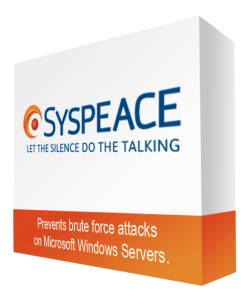 Syspeace prevents brute force attacks on Microsoft Windows Servers. Syspeace is a must-have complement for your IT security management. Syspeace works with Windows Servers and senses bad logins to other Windows accounts such as Sharepoint, OWA, Exchange Server SMTP mail accounts and Remote Desktop Services. We can help you secure your Windows Server. Syspeace is quick to download, but more importantly free to download and try for 30 days. Once you are ready an affordable per-computer license is available. Both are non-perpetual licenses, which means free updates are available as long as a license remains in effect. Protect your servers and try it out today. also known as password or dictionary attacks, on Microsoft Windows Servers. Syspeace is available for x86 (32-bit) and x64 (64-bit) architectures. Download our free 30-day trial for one or several servers. Please download the appropriate version for your system below. Let Syspeace make your servers safer so your business can focus on more important things.